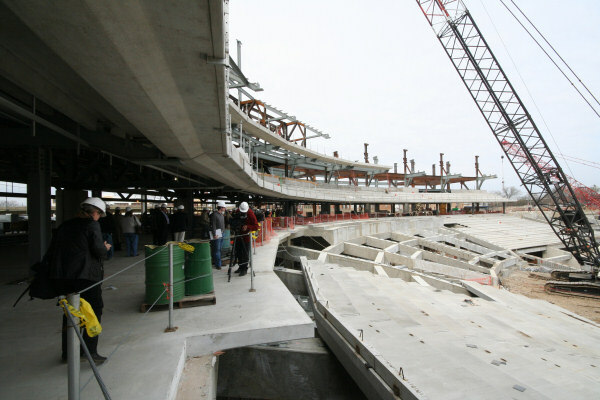 On March 26 the DC Sports and Entertainment Commission, the Nationals, and Clark/Hunt/Smoot held a tour for the media to show the stadium's progress. 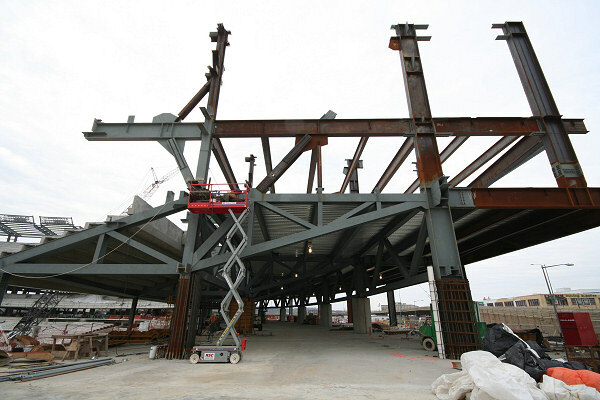 The state of the Nats ballpark on March 26, 2007, as seen from the concourse level behind left field. 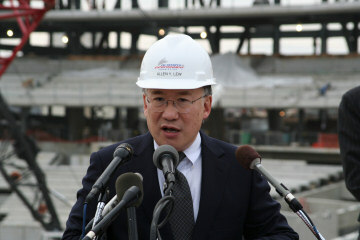 Allen Lew of the DC Sports and Entertainment Commission briefs the media--the stadium continues to be on time and on budget. 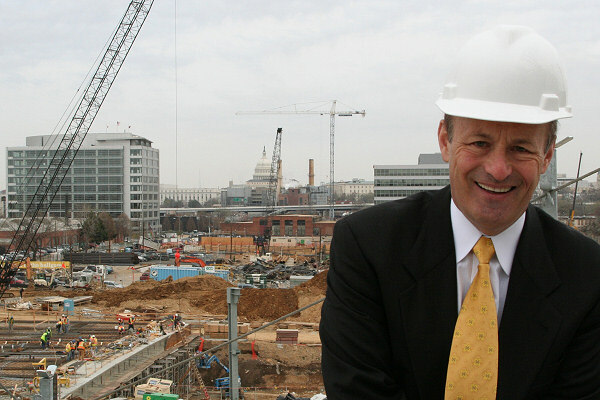 Nationals team president Stan Kasten. 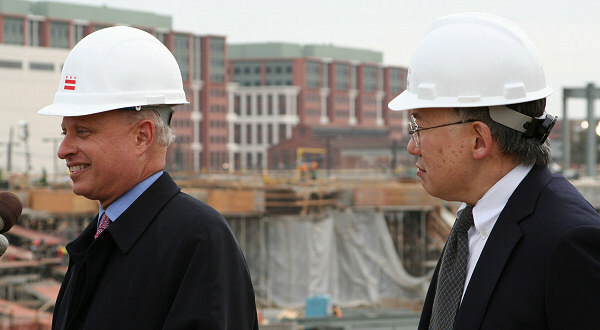 Nationals owner Mark Lerner and Allen Lew. 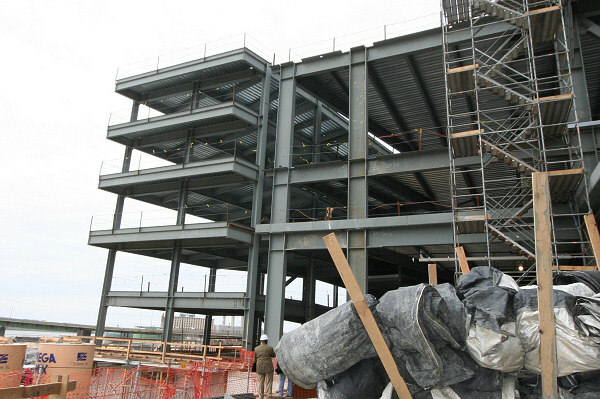 The steel work along the main concourse currently stops here, along the 3rd base line. A view of the construction in the outfield; the scoreboard will be on top of the steel currently going in at right. 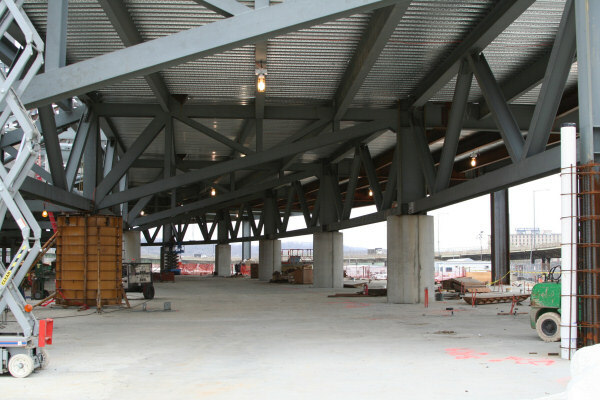 Looking into the main concourse level along the 3rd base line. Concessions, restrooms, and whatnot will all be to the right, along the exterior of the concourse, allowing the side of the concourse facing the field to remain open. A worker doing some welding. Looking to the outfield from the right of home plate (which will be located right about where the white chalky blotch is on the ground to the right of the crane, although about four feet of dirt still need to be excavated to get down to field level). 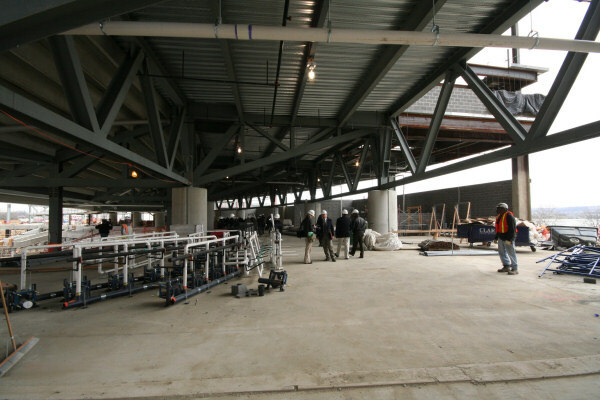 Turning and looking along the concourse level at the 3rd base line, standing to the right of home plate. 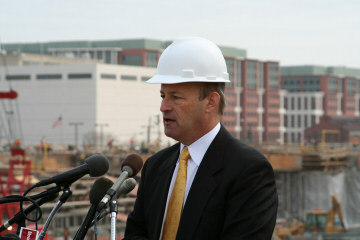 Stan Kasten being interviewed while standing on the concourse level. 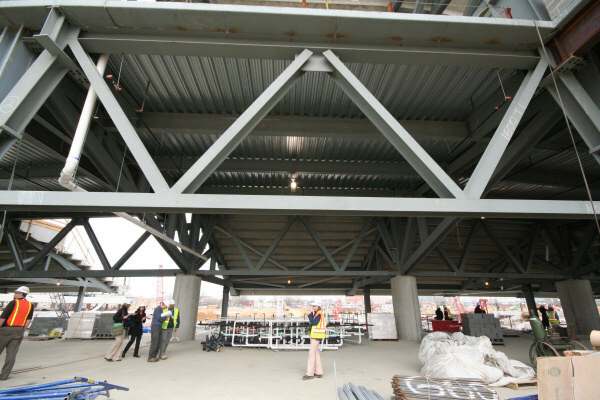 The steel work all throughout the concourse passes along the subliminal "W" message. 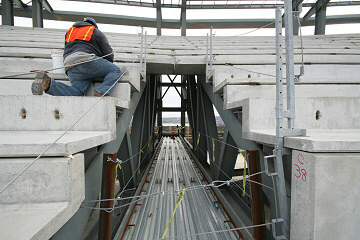 The walkway ramps on the south side of the stadium site, as seen from what will be the top of the grand staircase. 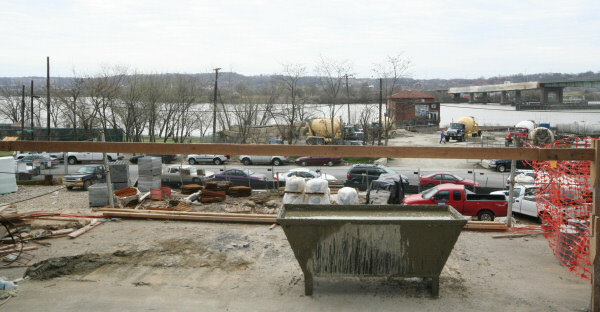 Standing at what will be the top of the grand staircase, looking to the southeast toward the Earth Conservation Corps old pumphouse and the Anacostia River. The tree-filled area will eventually be a 40,000-sq-ft public plaza known as Diamond Teague Park, with potentially a water taxi landing. The Florida Rock mixed-use development will be to the right, where the cement trucks are. The concourse level at the grand staircase entrance--the cinderblock walls at right will be the backs of the concessions and restrooms. 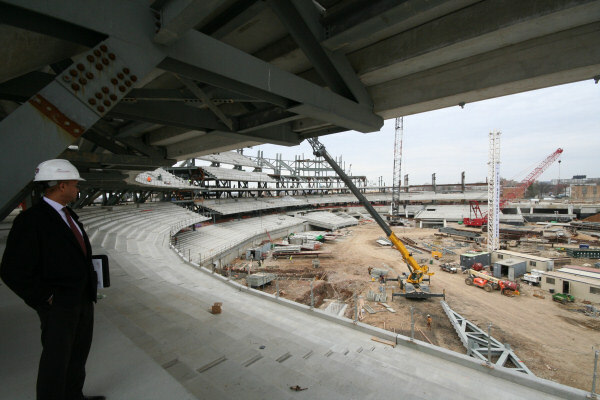 A wide-angle shot depicting the view of the field from the concourse, showing how open it will be. 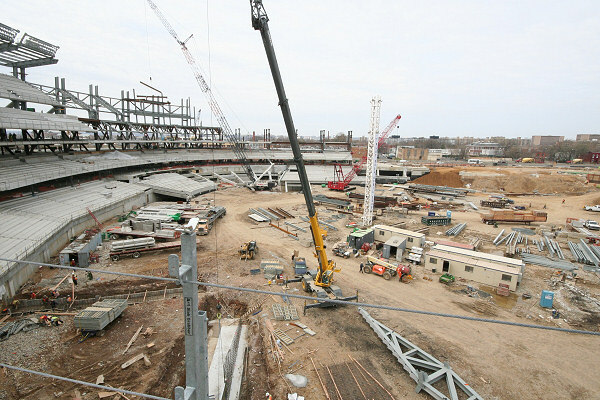 The current edge of the club level on the right-field side, looking north into the new steel work. 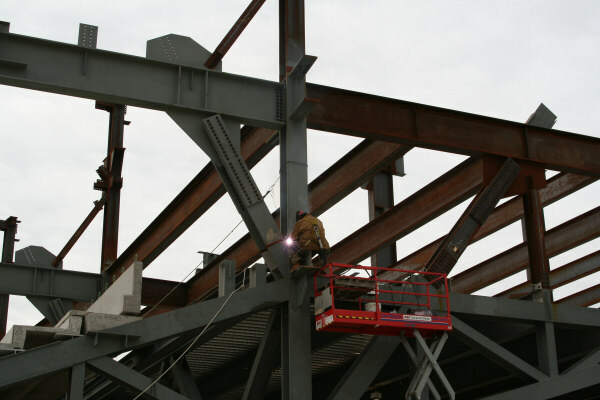 The scoreboard will be installed on top of where the steel angles to the left. Incoming DC Sports and Entertainment chairman Matthew Cutts surveys the field from the club level. The concession area on the club level (one level up from the main concourse). 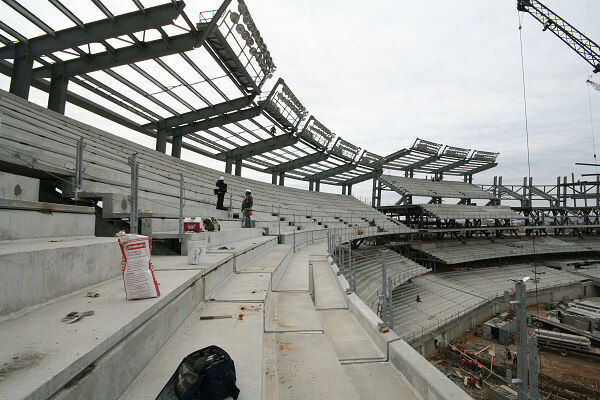 The exterior side of the club level, looking toward the Anacostia River. Looking toward center field from the 1st base line upper deck; the field wall is going in at lower right, and another 20-plus rows of seats will be built down from the current seating areas to the field. With your x-ray specs, you can see the US Capitol dome in the distance at center (this is a wide-angle lens; the dome is much more distinct in person). 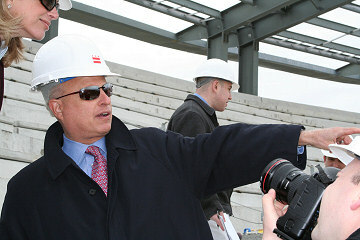 Mark Lerner looks down on his team's realm from the upper deck in right field. 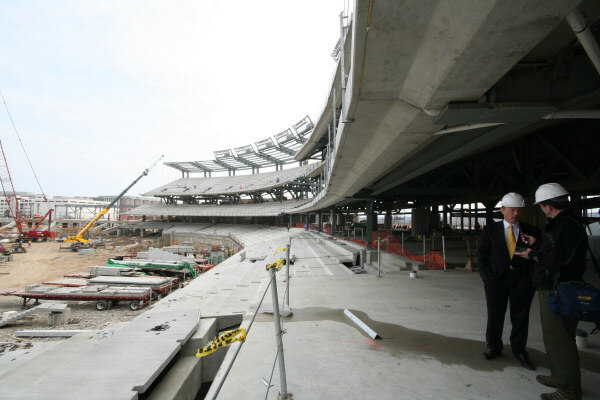 The entrances to the upper deck in right field are still somewhat under construction; the Anacostia River and Poplar Point are visible at the end of the walkway. Mark Lerner and Stan Kasten at the edge of the right-field upper deck, as work goes on below them. The Capitol dome is at center over Lerner's shoulder, and again is much more prominent in person (wide-angle lens are good for construction, bad for depth perception!). Another shot from the front row of the right-field upper deck affords views of both the Washington Monument (left) and US Capitol dome (right), as well as the work going on along the outfield. That is not my hand grabbing on for dear life, but given my fear of heights, it certainly could have been! 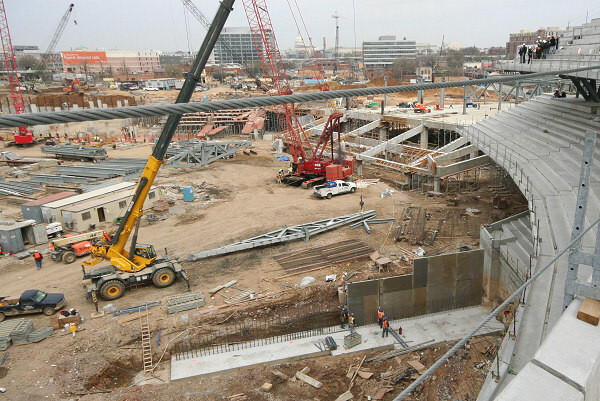 A close-up of the work that is bringing the concourse level around the outfield. 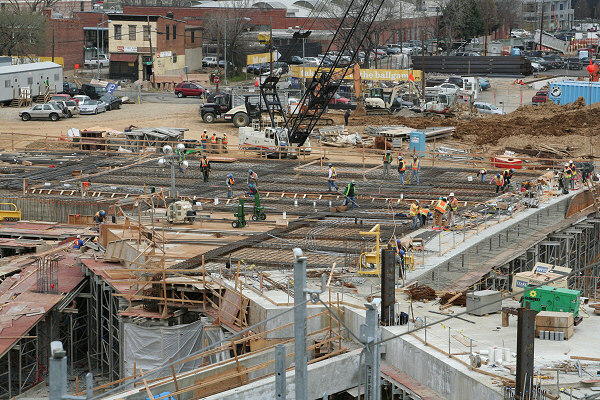 The corner of Half and N streets is at upper left, with the Monument Realty Half Street project site running along the rear right. High up in the sky in the upper deck in right field, not far beneath the lights. But check out the guy up in the lights. Stan Kasten on top of the world. The new office building at left is the Lerners' 20 M Street.